See the view the birds see. Climb 50 feet to our safe and shady observation platform. 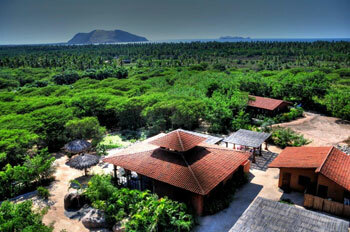 Catch a cool breeze as you enjoy the magnificent view of the Pacific Ocean. Visually explore the nearby lagoons, forest and mountains. Regard many species of our native plants while strolling along the trail. The plants are labeled with scientific and common names and uses. In particular, note our growing collection of local bromeliads, both epiphytic and terrestrial. This foot path is accessible to wheel chairs and strollers but it is a bumpy ride. They are as ancient as the dinosaurs. Though once abundant in Mexico, iguanas are now threatened from loss of habitat and human predators. Visit our iguanario; see black and green iguanas at all stages of development. Abundantly cheeky, gloriously colored, with intelligent behavior, sensitive personalities, and innate curiosity, New World Parrots enchant us. They are known to be long lived, uniquely monogamous and mate for life. Sadly they are endangered in the wild due to poaching and habitat destruction. At El Refugio you have the opportunity to sit in the shade next to the wild life pond and amuse yourself watching the macaws shout, chat and play with their toys. Found only in the Americas, these tiny birds hover in mid air by rapid wing flapping which creates the humming sound for which they are named. Of metallic iridescence and bright colors, we are captivated by their beauty and fascinated with their territorial aggression. Enjoy them as they sip the nectar of their favorite plants and from our many feeders. Sperm whales are toothed whales found in all oceans. They have the largest brains of any animal known to have lived on earth. The head is one third of the length of the body. We collected our cachalote bones during the summer of 2009 from the rocks below Guamilule. It was a heavy, hot and stinky process to lug enormous bones over the rocks, while avoiding the waves. The 18 meter skeleton we are preparing can truly be considered "awesome". To learn more visit our whale project page.